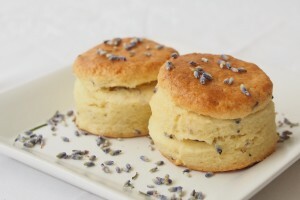 While visiting Australia last April we stopped by at the Lavender Farm where we had the most divine lavender scones. It seemed a bit weird at first to think of eating lavender but it turned out to be really delicious. I brought back some lavender with me from the farm. 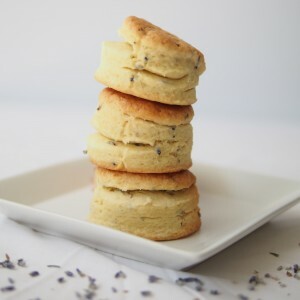 It was sold as being suitable for culinary use and I was excited about making my own lavender scones. I also used President butter this time and I found that it makes a world of difference. Much better with President butter! This is exactly the same recipe I shared earlier. But, I added Lavender this time. 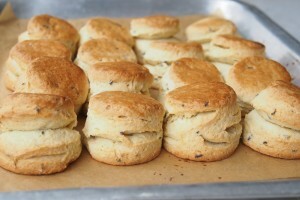 The original Buttermilk Scones recipe was from my girlfriend in Penang. You can find her recipe in Craft Passion with some modifications. Add sugar, Lavender and mixed well. In a measuring cup, beat the eggs with 6 Tbsp buttermilk together, and add this to the dry mixture. Put the dough in the bowl into the fridge for 10 – 15 mins. Remove the dough from the fridge.Form the dough into a ball, turn it onto a lightly floured surface and roll / pat it into a circle at least 1 inch (2.5cm) thick – not to roll it any thinner, this is the secret of a well-risen scones. 1. Traditionally, scones is served with clotted cream and fruit jam. 2. You can make buttermilk at home if you can’t get from shop. The following recipe will make one cup of buttermilk. If you need more, just increase the ingredients proportionally. 2. Add one tablespoon of white vinegar (you can also use lemon juice at a pinch). 3. Allow the mixture to stand for five to ten minutes.